“Fermat’s Enigma: The Epic Quest to Solve the World’s Greatest Mathematical Problem” is written by Simon Singh, a renowned author of books on mathematics and the sciences. Some of his best sellers include “The Code Book” and “Big Bang”. Simon Singh is adept at making complex topics accessible to neophytes. “Fermat’s Enigma” is a book that traces the history of the formulation of the problem in 1637 by Pierre de Fermat to its eventual solution in 1994 by Andrew Wiles. Along the way, we get to learn some math, get deeply involved in the lives of famous mathematicians and the see the effect of this problem on the evolution of mathematics. 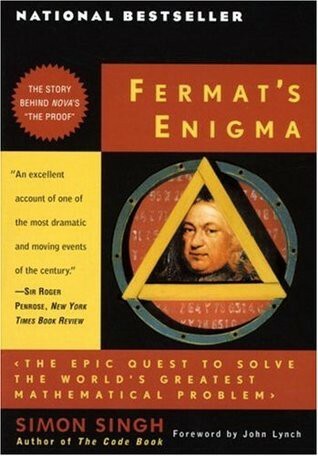 “Fermat’s Enigma” starts off by describing the evolution of mathematics from the time of Pythagorus to the time of Pierre de Fermat. It then talks about the life of Fermat, his achievements and the discovery of this conjecture in a book of his. We are then taken through the various attempts to solve this theorem in the 17th,18th and 19th centuries. Along the way, we see the effect that this theorem has on number theory, mathematics, mathematicians and their lives. The final chapters deal with the attempts to solve this theorem in the last 40 years. There is specific focus on Andrew Wiles, his life, his solution and the response it gets from the general populace and the math community. Solving this theorem is considered by many mathematicians as seminal as splitting the atom or deciphering DNA. There are seven chapters along with an epilogue in this book. The chapters are divided into smaller sections which will make it easy for readers to digest information in smaller chunks. There are several fundamental problems and techniques which are described in an appendix. Where do I start? There is very little that I did not like about this book. Simon Singh has once again explained a complex subject with a convoluted and rich history in a manner that reads like a thriller. This is a fast-paced mathematics book and we will find it very hard to put down. There is a lot of mathematics in this book too. Simon Singh has explained almost all of it brilliantly. In addition, the history behind this math has also been laid out very well. We get to see subjects ranging from the basic Pythagorean theorem to elliptic equations to modular functions to prime numbers and more. The insights into the many mathematicians lives, their motivations and challenges were enthralling. In addition, seeing how every contribution from various mathematicians in the 350 years culminates in a final proof demonstrates the beauty of mathematics. The appendix with its explanation of techniques like game theory and mathematical induction is the crowning glory. If I am going to nit-pick, it is that Simon Singh used some terms in his book which were not the same I was used to when I learnt these subjects. This book is great on so many levels. It is good enough to be considered as a book on history and a biography and a general read as well as being a book on mathematics. If you love mathematics or have heard of the Fermat’s Theorem or just love to read a good book, I recommend “Fermat’s Last Theorem”. You will finish this book with a sense of satisfaction and having learnt something new.